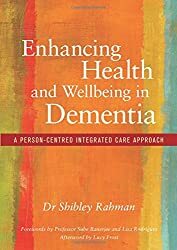 Shibley Rahman has published his third book in the series which critically examines dementia care and approaches towards greater holistic and integration across the board. Shibley has always been an inspiration and frequently provides us all with challenging controversial views. His work builds on the ethos of care proposed by the person-centred care models but tends towards a more collective and individualistic combination of dynamic approaches by incorporating a societal, organisational and individual focus. Since dementia is clearly a progressive illness it is heartening to consider the ways in which we can respond to the changing landscape of dementia care as one of fluidity and flux. Sometimes we expect people affected by dementia to continually positively adjust to these often subtle changes in ways which defy logic; how can we expect a person with dementia to remember their GP appointment if they are having a bad day and having trouble trying to make sense of their place in their own home? Every interview and conversation I have with those who give me their time to discuss their worlds, I am struck by the irony of how much providers assume people affected by dementia can consistently manage. The very nature of dementia changes day to day with seemingly small things impacting upon the ability to make sense of surroundings and people. This book articulates some of the ways in which professionals may make sense of their observations and in time pressed circumstances seek to validate their own responses. Organisations need to be honest and supportive of their staff in ways which will help them to understand their dynamic place in their relationships with others. This book goes a fair way to helping us all understand the ways forward towards truly integrated care. This will promote wellbeing in the widest sense rather than constantly firefighting every crisis. Every care provider team, statutory, third sector or private, could do far worse than read these books. Let’s all embrace the Rahman Effect. Recently a candid article, “Here’s to the ordinary world that I miss so much”, written by Rebecca Armstrong appeared in the press. As a carer of a disabled husband, Rebecca wrote about how excluded the couple were from experiencing the ordinary everyday things which most of us do. The mundane activities “wish list” included getting to the shops, shopping without stares from others and sleeping as man and wife together. No bucket list of heroic deeds for this couple as they attempt to navigate the challenges of marriage and disability to achieve some normality. Rather than seeking a sympathetic response, the writer exposed the persuasive barriers to achieving these aims as pragmatic issues. This is something we can all relate to, especially when faced with dementia in the family. The heart of achieving a dementia friendly society is one of visionary pragmatism. It is about inclusion in the ordinary every single day. This isn’t about money or some sustained severing of services according to whether they are social or health. It’s about letting people live the mundane which binds those relationships. Scaling the Peaks is a large qualitative study which focuses on living with dementia in rural areas. Rurality exposes some of the barriers to living the everyday which are also relevant to more urban dwellers. Rural dementia is essentially about infrastructure, equitable access and the ability to remain in the locality. It is also very much about frugality, realism and enjoying the mundane every day. What can rurality show us about dementia in older age? Firstly infrastructures provide the foundation upon which all other aspects of managing the everyday connect. Generally none of these infrastructures work in isolation; people are key to every part of this huge pivotal mechanism called community. This includes people with dementia, family and friends, businesses, service providers and community organisations. Too often health and social care are clumped together in the absence of their relationship to these infrastructures. Discussions and taking part in everyday activities with people living with dementia, have identified the “ordinary” infrastructures which mean the difference between remaining a part of the local community or becoming an outsider. Key infrastructures include; Transport, robust IT and phone communications, accessibility to meaningful places, affordability of fuel, food, leisure and interests, transport, safety, acceptance by others, maintaining independence. Activities such as attending church every Sunday, walking freely along the byways, feeling secure in your own home, enjoying a trip to the café and buying stamps at the post-office are all important to older people. The reality is that many of these infrastructures are fragmented as key providers find them no longer viable. These are the things that matter to people living in their communities regardless of their level of dementia. There is a need to raise the debate about how to support community infrastructures in ways which are sustainable, robust and viable. This means a shift from the assumption that a greying army of volunteers will manage to achieve this to one of combining business sense with a community ethos. Major service providers such as mobile phone and broadband, will have to commit to securing reliable networks, the current absence of which hamper all who work and live in rural areas. Likewise banking, post-office, pharmaceutical and food outlets need to consider the impact of abandoning small towns and rural locations. Equitable services may require levy to sustain them in rural areas. No doubt innovative ways will have to be devised to manage these foundational aspects of rural services. The second most important aspect of rural dementia is one of maintaining independence. Many older people fear the loss of control which dementia brings as it progresses. This includes the perceived narrowing of the world around them and the inevitable isolation this brings to families affected by dementia. Stigma and privacy are strong aspects of growing old in these communities. People do not necessarily identify as being old or even having dementia; working in the family business continues as a priority. Key services need to mitigate the impact of dementia but not subscribe to a one size fits all. In rural areas we also have a real need to accommodate the specific needs of men and women who are simply not used to being indoors. Years spent in the outdoors foster a sense of identity and security connections with key places. Many older people value community in ways which may seem alien to the more urban dweller. Places, seasons, weather, animals and people matter. There are genuine connections and meaning derived from observing the changing seasons, the patterns of nature and that this is understood by others. We do tend to physically isolate older people from experiencing the outdoors by constructing services within the often sterile boundaries of care settings which sever these connections. We attempt to sanitise dementia and in doing so compound the sense of loss of connection. Innovative services such as care farms, rickshaw rides along accessible byways and slow bus trips along lanes can all help to maintain a sense of connection with place. The Right to Roam, originally coined by the mass trespass in Kinder, is particularly apt for rural dwellers living with dementia. Families managing the challenges of dementia often speak of the sense of fragmented generic services. Generally introductory sessions are freely provided with subsequent attendance requiring an often significant contribution in money and time. In reality this means securing extensive funding for day care but being unable to access this because of the lack of suitable incontinence products for the journey and day away. This is a false economy and fails not only the individuals but also the whole ethos of social care. Families feel left to manage these issues alone and find the message of dementia friendly societies as an empty mantra. Families affected by dementia need advocates and champions to challenge the funding decisions such as a removal of laundry services not as some inevitable consequence of austerity measures but as a fundamental part of maintaining dignity and valuing the incredible work spouses and family undertake every day. Many rural families access help late only to find a lack of holistic provision which can enable them to continue caring and avoid crisis. Crisis in dementia is regarded as an inevitable aspect of dementia by families and whilst some may not be avoidable, greater attention can be given towards the recognition and avoidance of preventable crisis. Service providers also express the deep frustration which they experience in having to manage tight budgets and constraints on their time. However, the current sense among professional providers is that multiple crisis episodes are an inevitable aspect of dementia. In rural areas reaching a crisis with no responsive home support can lead to practices such as sectioning in order to secure the intensive support required. Rural people with dementia do not have the same choices as more urban dwellers; there is a significant lack of residential and nursing homes. As such respite care is often patchy and leads to long delays even when approved in finding a bed. In remote rural areas, many carers are happy to consider a couple of hours a week as sufficient but this is often not viable as care staff will not travel to the remote places. This has led to an assumption that since people choose to live in remote areas then their needs will be met by family. However, many families are dispersed and it isn’t uncommon for an aging farmer to be working alone or a retiree to be isolated without local ties. If dementia develops then the first professional to become aware of this is the vet as animal welfare becomes an issue or the local pharmacist who notices increased confusion. Labelling places and communities as dementia friendly may lead to families not wishing to access dementia specific services. There is simply no singular model of a dementia friendly society. In rural places services have to encompass the everyday living experiences of dementia. Dementia may not be the primary concern but a part of many other challenges such as managing a business or retirement. Growing old need not mean being isolated from the community. It may be that we need to consider developing age friendly societies which encompasses the entire life course to enable communities to grow together regardless of age. Sherriff, I., Marshall, F., Pascoe, A. (2017) The Rural Dementia Charter, The Prime Minister’s Challenge. Alzheimer’s Society, UK. Marshall, F (2017) Dementia in Crisis; recognising and avoiding crisis in the community Age & Ageing (pending). Marshall, F (2017) Empathy in Stroke Units in Waring,J., et al (eds) Transitions in Care. Routledge Press (pending). I’ve spent the past couple of hours with Jane and Mary from the Farming Life Centre, Blackwell, Derbyshire building a dedicated Facebook and wordpress website. Jane and Mary have provided essential help whilst I provided cookies (the oaty ones not the computer type) So here goes…..
I’m really lucky to be fullly funded by the Alzhimer’s Society to undertake a 4 year study which will examine rural dementia. This is a new venture for the Alzheimer’s Society who recently decided to allocate research funding to care in addition to the more biochemical research. Why rural dementia? Well we know a fair amount about urban care because the majority of studies have tended to take place in the immediate vicinity of universities and organisations which are located in the cities. Models of care, including the design and delivery of services for families affected by dementia have tended to pay scant attention to the challenges of rural living. We know that rural services cost more to deliver than urban and that this has an impact on the range of services. In these times of austerity rural care will inevitably have to show real value for money. This research intends to contribute to the growing body of knowledge which is examining the design and delivery of rural services. We know that urban models tend not to work particularly well in rural areas for many reasons. Some of these reasons may be clear and others more opaque. Infrastructures such as reliable regular transport to local GPs and shops are key to older people remaining independent, fuel costs for heating and cooking tend to much higher in rural areas because of the reliance on oil, housing costs are higher in the most picturesque parts of the UK because of the demand for second homes and rural idylls, the demographics lean towards more older people and less young families which impact upon the availability of care givers. And the list goes on. The more hidden reasons are ones which may be common regardless of where you live; pride and resilience, stigma of dementia, having to carry on in work, multiple types of illness and isolation. A weekly social meeting can make all the difference to feeling well or feeling rotten and isolated. So this work aims to highlight some of those issues and to share them with key organisations so that services can be designed and delivered and sustained in ways which truly fit rural communities.